When people ask me what is the fastest trike in our shop, I don't hesitate to answer, "the Catrike 700". This trike has been created for one purpose: speed. So if that is your number one consideration there is no better production trike available. This trike is for all the speed freaks out there looking for something that can compete against any road bike. The model name "700" refers to the rear wheel. The rear wheel is the 700c that is found on most standard road racing bikes, giving you the gearing that matches the fast two wheelers. I chose this trike for myself over all the others mainly because its the fastest trike we carry, and it has a comfortable laid-back seat angle. I just wanted something I could fly on, and the 700 is most definitely the trike to do it. 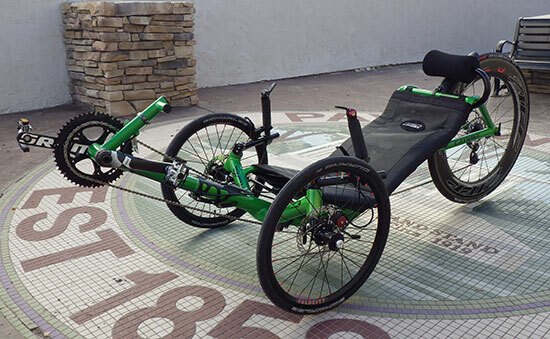 The 700 is the top-of-the-line Catrike, sharing similar components with the slightly newer Expedition model, but with an emphasis more on speed than touring. The main differences between the two models are the wheel sizes, seat angle, track width, and ride height. The 700 is a bit narrower and lower, and the sleek single-piece frame design makes the 700 look strong and fast. Its low profile and large rear wheel makes the 700 scream speed, giving it the ultimate racing look to match its all that fast and furious potential. The frame is a single piece design, which means the seat is integrated into the frame. This means the seat angle and position is not adjustable, but the frame is stronger and more rigid. The frame is made of heat-treated aluminium, making it strong and light. The stiff frame has barely any perceptible flex which helps to improve handling. 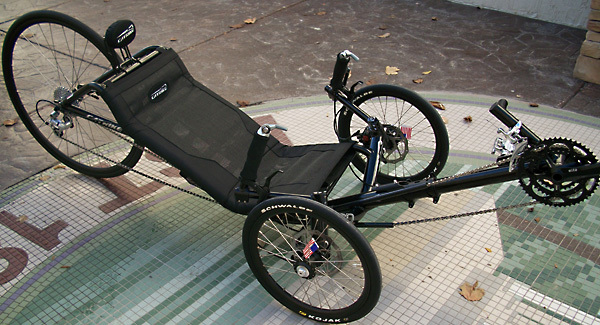 The aluminium construction makes the frame of this trike only about 8 pounds, not including wheels and steering components, putting it on the lighter end of the spectrum. 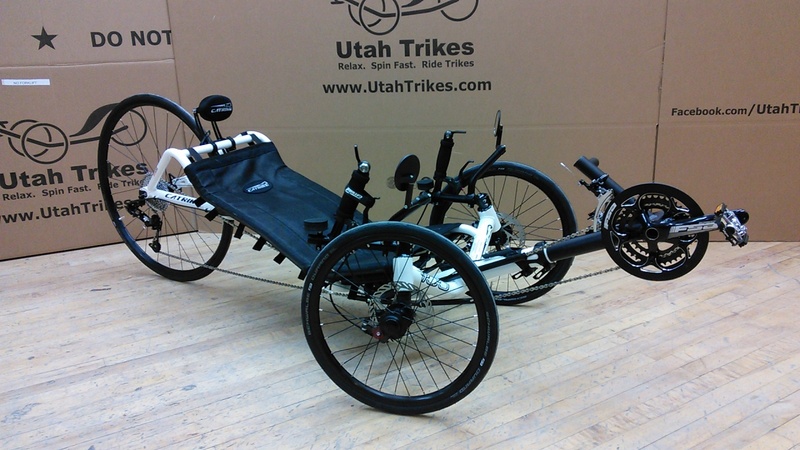 Besides the smaller Speed, the 700 is Catrike's lightest adult trike available. The 700 comes standard in black or a gun metal silver. While I could have gone with any color, I chose the stock black just because of the sleek look it gives the trike. One of Catrike's manufacturing capabilities is that they do their own powder coating on site. This gives them the flexibility to offer many different colors without time delays and huge upcharges. Besides the sleek laid back seat, the 700's main feature is its wheels, it has 16-inch wheels on the front and a 700c on the rear. The 16s give it a very low center of gravity which means less possibility of lifting a wheel off the ground, and the large rear wheel gives it great top-end gearing. The black alloy wheels are lightweight and can handle a wide range of tires. The wheels are machine made to keep the cost down. The rear wheel is good quality, but does need truing and tightening depending on how you ride. The front 16-inch wheels are of the same quality, but being so much smaller they only need truing half as often. 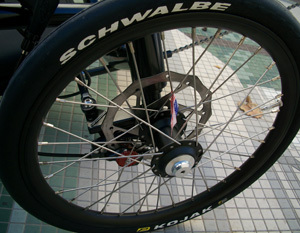 The standard tires for the front are the Schwalbe Kojak racing tires and the rear is the Schwalbe Ultremo DD. The Kojaks are a very fast light-weight racing tire, giving this trike low rolling resistance and good traction. The Ultremo DD (dual defense) is a super high pressure road tire. The Ultremo also has a ceramic gaurd to reduce punctures. Since the tires are designed for racing they do provide a fairly rough ride on poorly maintained roads. On smooth roads and trails though they are just about as fast as you can get. The angle of the seat is different for every model Catrike, the 700 has a 27 degree angle, it is the flattest recline of any Catrike, giving it very low air resistance. The laid back seat also provides a lot of back support making it very comfortable. The seat position is, like the rest of the trike, designed for speed! While you can't adjust the seat itself, the 700 has an adjustable boom to set your leg length. It slides in and out of the frame to change the distance of the pedals from the seat using a pair of quick releases. Like all the Catrike models, the boom is keyed to keep it lined up and prevent it from twisting in the frame. The handle bars on all the Catrikes are very adjustable, you can change the hieght, angle and distance from the head set with just a few allen screws, it took me a few days to get mine just where I wanted but when I did it really made a difference, and I found the 700 offered a much more enjoyable ride. 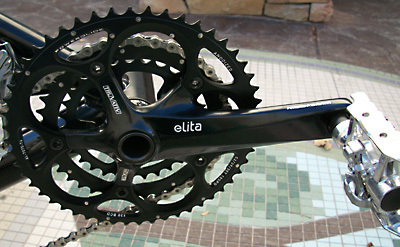 The 700 comes with the Truvativ Elita triple crankset up front. It's very light with a sealed bearing bottom bracket which makes the whole crank assembly very strong smooth rolling. 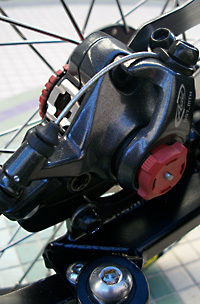 The new Catrike 700s come with the MicroShift 9 front derailleur. It seems to be the equivalent of the Shimano Tiagra which used to be stock. The MicroShift is not the best on the market but does its job without hesitation. If you are planning on using a larger chainring than the stock 52 I would recommend a beefier derailleur. At the rear, the 700 wheel has a SRAM PG950 9-speed 11-32 cassette. The PG950 is of steel construction. It shifts well and is very strong. For a quieter ride I'd recommend an aluminum cassette like the PG970. The 700 features a Shimano Deore LX derailleur paired with the Shimano DuraAce/Ultegra bar end shifters, the LX is a good mid level bar-end compatible derailleur, it does need tuning regularly but if you keep it well maintained it works well. I prefer grip shifters myself, so I chose to switch to the SRAM X-9 rear derailleur and shifters. The gear inch range is about 25-125 gear inches, with 27 different gear combinations and about 14 distinct gear ratios. This range gives you a decent climbing gear with a better top speed than most trikes. There are several things you can do to expand the gearing on the low and high side. Most riders will find the stock gearing adequate. At 90 rpm cadence you can hit about 33 miles per hour, making this trike one of the fastest on the market. I changed my large chain ring to a 56-tooth which allowed me to hit about 36 miles per hour at a 90 rpm cadence. If you really have a need for speed the Schlumpf High Speed Drive will give you gearing to go about 43 miles per hour at a 90 rpm cadence, while also dropping the low gear down to 22GI. The pedals on all catrikes are a combination platform/spd pedal, these are nice because you can ride comfortably whether you have spd specific shoes or not. 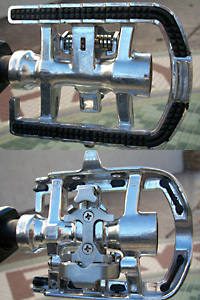 These are the same pedals that come stock on all the Catrike models and are fine for casual riders. More dedicated riders will definitely want to invest in a better set of clipless pedals to insure your feet do not come off. The 700's drivetrain is complimented by a single power idler and a chain tube on both the return and power side to keep the chain from scratching the frame. it does make some noise but isn't a huge bother. There are idler kit upgrades available to remove the chain tubes all together and make the ride even smoother. The idler used is the TerraCycle aluminium toothed power idler. It's a great idler and has excellent bearings that allows it to roll smoothly. 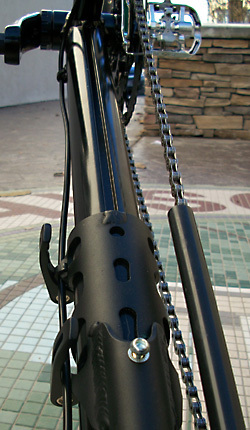 The return chain tube routes the return side of the chain. Because there isn't a lot of pressure on the return chain it doesn't wear in the tube or make too much noise. We've come up with a High Performance idler kit that adds an additional return idler and eliminates the chain tubes, making the chain run with little to no interference. 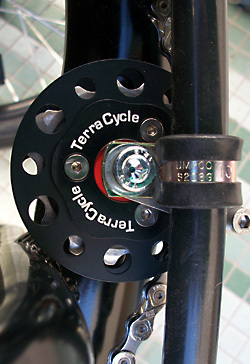 The steering on all Catrikes is known as direct steering. The handlebars are connected directly to the steering pivot point making it very responsive, as well as allowing it to have a very tight turn radius. While the steering is responsive and fast it is not at all twitchy or unstable at high speed. Quite the contrary! As you accelerate, the steering actually becomes more stiff. I notice this more on the 700 than on the other Catrike models. This makes the 700 great for fast downhill runs where you need a predictable steering behavior. When I first started riding I did notice some pedal steer but as I played around with the boom length and my own sitting position the pedal steer completely went away. There is a small amount of brake steer at faster speeds, but it's virtually nonexistent at slower speeds. A lot of people are concerned with speed, but a lot more are concerned with safety, the 700 has a strong set of Avid BB7 mechanical disc brakes. The brake pads have a large surface area and great stopping power. The 700 comes standard with the Avid 160mm Roundagon rotors. The BB7s are easy to adjust, with nobs for the outer and inner pads its very easy to keep them in tune. The Catrike 700 comes with a mirror, flag, and a head rest. The mirror is pretty much essential when riding in traffic or on city roads. The small orange triangular flag isn't quite essential but it is a good idea. The 700 also comes with the new Catrike cargo seat. It has side padding and pockets in the back for a toolkit, pump, and other extras. The 700 is a fantastic trike in its stock configuration. But, most of us have the desire to tweak things and make them our own. The main upgrades I did were switching the crank to a larger 56 tooth chainring, and I switched the rear cassete from the stock pg 950 11-32 to the pg 970 11-34. I also changed the shifters from bar ends to grip shifts and changed the rear derailleur to the X-9, I also added the Arkel Catrike 700 bags. The amount of upgrades that can be done with gearing, tires, and general accessories are substantial. The 700 RED edition is an example of an over the top 700 rigged for racing. The 700 has a very low center of gravity keeping it glued to the ground. You really have to fight to lift a wheel off the ground. At extreme high speeds and around very tight corners, the handling is incredible. 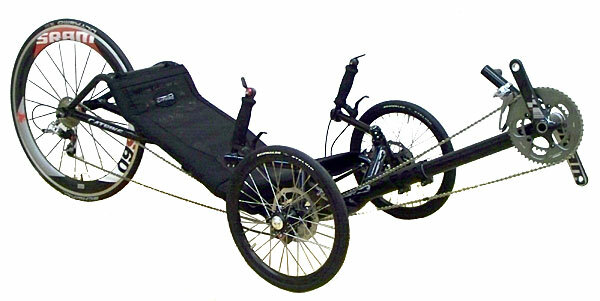 The rigidity of the frame and the quality of construction makes this trike roll very straight. You will notice some pull when there is a large crown in the road, on a flat trail it rides as straight as an arrow. The overall construction and design of the frame and steering keeps me comfortable at nearly any speed. Being a mechanic and building many of these particular trikes, I know how they are put together. Knowing what they're made of gives me peace of mind when riding at any speed. I routinely hit speeds in excess of 55 miles per hour and always feel very comfortable. For $2750 there isn't a trike faster, more comfortable or more cool to me than the Catrike 700, its fast, sleek, sporty and just down right cool. What more can you ask for?